February 11, 2015 – Tuffy’s Pet Foods, Inc. of Perham, Minnesota, is voluntarily recalling specific lots of Nutrisca Chicken and Chick Pea Recipe Dry Dog Food because they have the potential to be contaminated with Salmonella. The product was manufactured for Nutrisca by Tuffy’s. The affected product was distributed nationwide to distributors, brokers, retail stores and internet retailers. 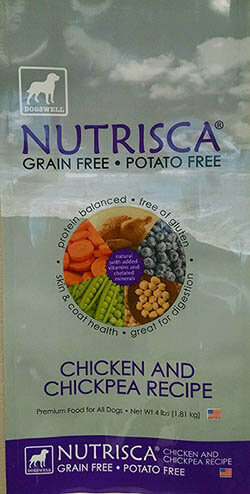 The recall is limited to Nutrisca Chicken and Chick Pea Recipe Dry Dog Food in 4 pound bag sizes and bear UPC Code “8 84244 12495 7” (found on lower back of the bag). No other bag sizes or other Nutrisca dog food, cat food, biscuits/treats, supplements or other products are affected by this announcement. The company is coordinating this voluntary recall with the FDA and is issuing the recall action out of an abundance of caution. Consumers who purchased the 4 lb. bags of dry dog food product subject to the recall should stop using the product, discard it in a safe manner (for example, a securely covered trash receptacle) and contact Nutrisca at the number below for further information. For consumer information or questions regarding this voluntary recall, please contact Nutrisca at 888-559-8833.